It is the night before All-Hallows Eve. The moon hangs low in the sky, partially hidden by Bald Mountain which holds the earth like some great slouching monster that crawled up from a deep, dark pit. The mountain broods above the small town of Rutland, Vermont and in the town's rustic church, a memorial service is just ending. As the church-goers leave the building, their eyes are suddenly drawn towards the mist-wreathed mount and upon an eerie blood-red glow which emanates therefrom! Even as the ceremony ends, on a nearly-deserted side street in New York's Greenwich village, similarly clad figures stand on the roof of a low building, outlined against a moon-struck sky. Then, one by one, they drop lightly and nimbly to the adjacent gabled roof below where they gaze with shadowed and sinister eyes through a skylight window at the one who dwells within...at the man known as Doctor Strange! Strange appears unsettled this night as he senses unseen malignant forces at work in the universe. Standing before his mystic Eye of Agamotto in his sanctum sanctorum, he urges to magical device to rise and reveal the face and name of his shadowed fears. A image slowly forms in the glowing sphere, the image of Dormammu striding like a maddened giant ripping apart the heavens to step from his world into ours. Doctor Strange is shocked but unsure as to when these events are to occur. Is it the present or the future? Strange replaces the mystic Eye and sits himself to ponder this recent discovery. He is confused since Dormammu has sworn to not enter this dimension, a vow which binds him like a living chain. However, he broke that promise once before and paid dearly for his failure (see Doctor Strange #173). The mage reminds himself that Dormammu's lust for power is such that attempting to conquer Earth's dimension is well within his personality. Suddenly Wong, Strange's faithful servant, surprises the uninvited guests and attacks them with the skills of a master of the martial arts. However, he is outnumbered and easily over come. And, as Wong lays on the carpet unconscious, the hooded men carry Strange's limp body out of his violated sanctum. Meanwhile, the phone in the hallway remains off the hook and a voice on the other end sounds frantic. Untold moments later, Wong is shaken awake with urgency. He opens his eyes to discover Ms. Clea who hurried over after Wong failed to return to the phone during their conversation minutes earlier. He quickly explains to her what he witnessed. Clea thinks for a moment and then decides to use her extra-dimensional powers and Strange's Eye of Agamotto to attempt to discover where Doctor Strange has been kidnapped to. So strong are Clea's desperate images of the man she loves, that through the mystic Eye, they transcend the bounds of time and space reaching willowy sea-beds off the New England coast contacting the Sub-Mariner! Namor, without hesitation, realizes this is a call for help and with no remorse for other quests delayed, speeds southward to the plea's source. Nor is Namor alone in receiving such eerie emanations as the great green behemoth known as the Hulk responds likewise to the distress call knowing that somehow, the one who calls himself Doctor Strange is, once again, in need of assistance. Miles away, at a place with the unlikely name of Breezy Point, a coastal radar station picks up the blip of a rapidly moving object but before the harried operatives there can get a fix on the sudden blip, it drops beneath the radar curtain is swiftly gone...sparing the men below an encounter with Namor, the Sub-Mariner. Moments later, the Prince of Atlantis is flying over New York City. In flight, propelled by his small ankle wings, he ponders the reasoning of Doctor Strange's summons and decides that he dare not ignore the call, no matter what the risk. An elderly lady, sitting in a chair at her fifth floor window, sees the flying Sub-Mariner and quickly runs to the telephone and calls for the police... While elsewhere in the human jungle that is New York, the police, who had responded to a break and enter call, are surprised to discover the intruder to be the Hulk! The green skinned hero is forced to throw a box car towards the officer's car to protect himself from the bullets of their service revolvers but then quickly he departs, leaving the police men shocked but unharmed. The long night is drawing near dawn and the car which carries the unconscious Doctor Strange and his kidnappers approaches a darkened lodge. Three hooded men exit the vehicle, two of them carrying the body of Strange. The trio discuss the fact that they are not to proceed any further until later this evening for it is written "the host-body shall ascend the face of the mountain by the early light of the moon". Doctor Strange's unconscious form is then gently lowered onto a table for fear of damaging what the hooded figures call their master's living receptacle. One of the cloaked men wonders what may have happened to Strange's astral form, now that his corporeal form has been brought here. The apparent leader of this group says that matters not, all they need to do is ensure that Strange's body stays free of all rival life forces so that it may receive a new master, one who can enter this world only by inhabiting the form a sorcerer of considerable power...the dread Dormammu! Back in New York...Namor hides in the back alleys, dodging the police cars which prowl the streets looking for "a man in a pair of swimming trunks". As he vaults each fence between yards, Namor is suddenly caught under a tumble of crates apparently hurled at him. Freeing himself quickly, the Prince of Atlantis notices a huge dark shadow and launches himself at his would-be attacker. A moment's struggle ensues...a fleeting clash between two shadowed titans amongst shattering crates and then the combatants move into a wedge of light. The Hulk and the Sub-Mariner stand face to face! After a moments confusion, Namor quickly explains the obvious; they were both summoned by Doctor Strange. Neighbours, who overheard the ruckous of crashing crates, crane their necks out thier windows and tell the two shadowy figures to keep the noise down! With as much stealth as the Hulk can muster, the two Defenders slink away down the back alleys, avoiding the many police cars which search for the pair. Suddenly, Namor and Hulk hear the hushed voice of a woman. Stepping out from the shadows are Clea and Mr. Wong. She explains why the pair was summoned and relates the evening's earlier happenings. Somewhat suspicious, Namor accepts the word of this strange white haired woman and her bald headed oriental companion as they present him with some street clothes so that he may mask his obvious body features. Clea then turns her attention to the Hulk, whose size prevents him from wearing any clothing. From her hand bag she draws a gold metal disc attached to a short chain and slowly swings the piece in front of the green behemoth's eyes...in mere moments the Hulk is no more and a man named Bruce Banner stands in his place. Banner, his memory somewhat foggy from the transition, learns of Clea's minor mystical powers and accepts both clothing and some tranquilizers from her to control his secondary personality. Clea then explains that their next step is to get to a site in Vermont where she has managed to trace Stephen Strange's physical form. However, she cannot detect his psychic self. Namor is about to ask for clarification when suddenly the foursome is confronted by two police officers. The cops warn the group that the Hulk and Sub-Mariner are about but before the two officers can question the four as to why they are out strolling so late, one cop notices a shadow up the street and they head off to investigate. Relieved, the group sets out again to search for Doctor Strange. Back in Vermont, dawn breaks over the lodge inhabited by the cloaked minions of Dormammu. One worshipper asks the leader why their master would want to inhabit the body of his most hated enemy. The dark leader explains that Dormammu made a vow which physically prevents him from entering this world to make it his. Yet, after tonight he will be in Strange's body in spirit and shall walk amongst us not a mere mortal wizard but as Dormammu! His first plan is to bury the state in a volcanic hail of hell-fire and make it his first shrine in this dimension. And, nothing will stop him! NOTHING! Hours later that night, on a winding road leading into Vermont, Namor, Bruce, Clea and Wong sit anxiously while the bus they ride in draws them nearer to Rutland, where they know they are going to face some unknown enemy. Meanwhile, in the town they approach, a spirit of revelry lies lightly upon the heart of the land as the town celebrates Hallowe'en. Children and adults alike are adorned in costumed garb in the spirit of the autumn holiday. But, the gales of laughter do not reach the dark robed silhouettes who begin to ascend Bald Mountain amid the embers of the fast-dying sun. Between two of the figures, a liter carrying the vague form of a man can also be seen. In the town, the parade is already well under way by the time the bus pulls into the depot and deposits its passengers into the street. Wong notes that the trip cost them precious time yet Clea reminds him that they most be inconspicuous if they are to be successful. She also asks the faithful servant of Strange to remain behind but then decides against it as they may need many hands before this night is over. The group then notices the eerie glow high on Bald Mountain and realize that it is there that Doctor Strange's fate and Earth's destiny weigh heavy in the balance. The red glow which can be seen from below emanates from the torches used by the dark robed worshippers of Dormammu and from the dimensional portal which has opened like a festering wound in the sky above them. Sneaking up the mountainside, Namor strips out of his civilian clothes and is once more the Sub-Mariner. The foursome ascend the mountain quickly and it is only near the top that they notice it is the dread Dormammu himself they may yet have to face! Dr. Bruce Banner turns to ask Clea who the dread one is (after all, he has never heard of the demon) when he accidentally dislodges a rock which crashes down the slope and alerts the robed figures of the intruders. Clea attempts to magically attack the advancing zealots but fails when she realizes stronger spells are protecting the robed ones. Bruce panics with frustration but is unable to become the Hulk because of the tranquilizers which course through his system. But, Namor attacks at full-speed and sends a quartet of the fanatics flying! With the Sub-Mariner holding his own, Bruce advances on the circle of cloaked figures who guard the body of Stephen Strange but he is jumped by a second group of worshippers which provides just enough anger to allow transformation. Suddenly, the second string of zealots are scattered like tenpins as the Hulk is reborn! Namor, meantime, weakened from his long absence from water is slowly being overcome. The Hulk unsure as to why they are fighting, attempts to show that he is the strongest of all, so picks up a massive rock and hurls it. The huge boulder lands over the head of Namor and diverts a stream which was flowing down from the mountain top. The water splashes onto Namor and his attackers. 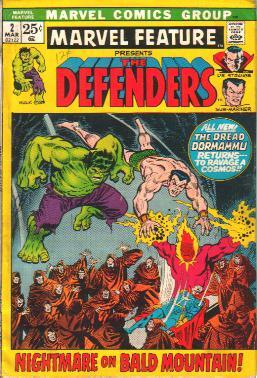 A renewed Namor and the Hulk battle the robed figures attempting to retreive the magician's body. But, even as the two Defenders attack, the mage's body begins to drift upward and towards the dimensional gate. Suddenly, Wong reports to Clea that he is feeling weird and demands that she turn a spell upon him quickly. Clea is confused for a moment but then realizes that Doctor Strange has been with them all along, his astral form hiding in Wong's body like a benign hitchhiker. With a pass of her hand, Strange's astral projection leaps from Wong and rises to meet his body which hovers in the air, passing through the dimensional opening. It was the only way Strange could have survived this long. The Master of the Mystic Arts reasoned that at some point during the ritual, the spell preventing his psychic form from entering his body would fade (to allow Dormammu access), and when it did, he would be sure to enter his body again to become one before the dreaded one had the opportunity! At the gateway between the worlds, Strange faces his arch nemesis, Dormammu. Doctor Strange quickly erects the Shields of the Seraphim as Dormammu blasts him with mystic bolts of energy. Strange then uses Bolts of Bedevilment and hurls the dreaded one's own spells back at him. The Dark Lord seethes in anger at being foiled by the magician. Dormammu then launches a second volley of mystic energy at his foe but Strange easily meets the attack with equal force. Dormammu is confused at first for he is by far the more powerful of the two, a stalemate this battle should NOT be. But, the dread Dormammu suddenly realizes that as long as the gateway between their worlds lay open, his mystic powers are being drained. In a last desperate act, the vile demon unleashes nature's own forces as heaven, for a fast fleeting moment, seems to stretch out its jagged arms towards hell and Bald Mountain erupts in anger. Rock and earth come crashing down on the gathered worshippers causing the gate to slowly close. Namor and the Hulk sheild Clea and Wong from the falling debris with their own bodies. Doctor Strange turns for the closing gate as Dormammu heads off back into his own dimension promising that they will meet again another time. Doctor Strange exits the portal just before it closes entirely and swoops down to pull Clea and Wong to safety from the fatal avalanche of rock. The mountain lies in ruin, and as the dust clears, Strange starts to mourn the loss of his friends Namor and the Hulk when suddenly Clea notices movement in the rocks. With slow agonizing movements, the Sub-Mariner and the incredible Hulk pull themselves from the debris much to the relief of the watching trio. The Hulk quips that he will NEVER die while the Fish-Man is still alive! The heroes stand silhouetted in the moonlight, Defenders of humanity. The mountain side becomes quiet then, a halo of fine mist hovers wraith-like over the ungraven monuments of stone which mark the resting place of Dormammu's disciples. And, one can only hope that all the evil which men do is buried with them, for all time. Yes. One can only hope. (NOTE: This issue also features a "fabulous fifties featurette" backup story called Sub-Mariner: The Hidden World which deals with a second Moon between the Earth and the Sun whose aliens steal all of Earth's water AND the Sub-Mariner! This story is not summarized as it has no bearing on the Defenders).